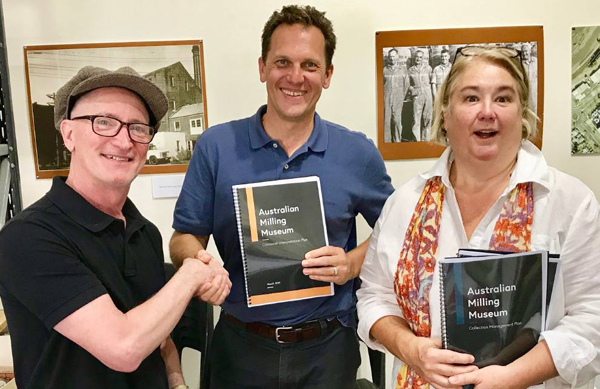 Stephen Thompson from Australian Curatorial Services hands the Australian Milling Museum’s Curation Plan and Collection Policy to Jess Jennings and Samantha Friend. The Australian Milling Museum planned for the Tremain’s Mill site has reached another milestone. A formal handover was held on Friday of the new museum’s Curation Plan and Collection Policy, developed by Stephen Thompson of Australian Curatorial Services. The Australian Milling Museum’s (AMM) CEO Jess Jennings and chair Samantha Friend received the documents, which they say will be critical to the future success of the museum, particularly in terms of telling the history of Australian grain milling and establishing a collection of equipment, artefacts and archives. Mr Jennings is currently documenting the career of a technical miller, Alan Reid, who started his career when steampower was still in vogue and worked right up to retirement in the year 2000. “We are so lucky to receive personal archives like Mr Reid’s because he’s basically documented his entire career from steam-powered milling through to major corporate takeovers and everything in between,” Mr Jennings said. “There’s a heap of fascinating stories to tell when you look into it. Tremain’s Mill is in lower Keppel Street.